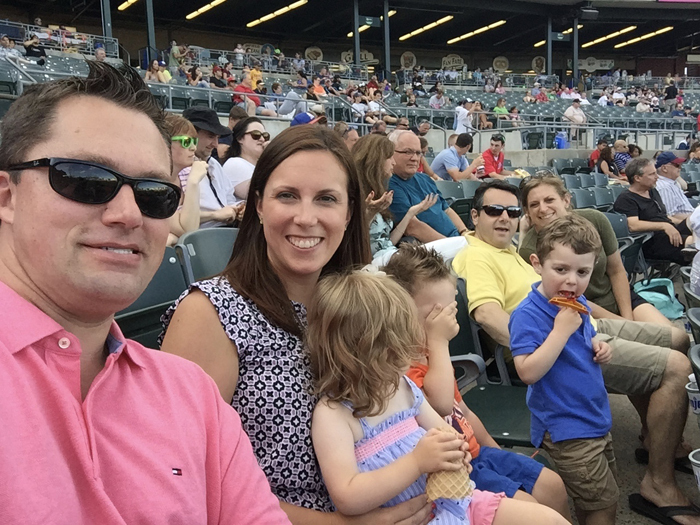 Last weekend, we went with our friends to a minor league baseball game. Our local team really isn't very good. They aren't affiliated with a major league team and I'm not sure they are even in a real division. So going to the games really doesn't have much to do with seeing good baseball, at least that's how I feel. It's more about spending the evening outside and eating the typical ball game food. The fact that there's a baseball game going on is just kind of background entertainment. We chose a 5:05 game so that it wasn't too hot but also wasn't too late for the kids. We lucked out and had some pretty ideal weather for our night of baseball! To be honest, Noah wasn't that excited to go at first. 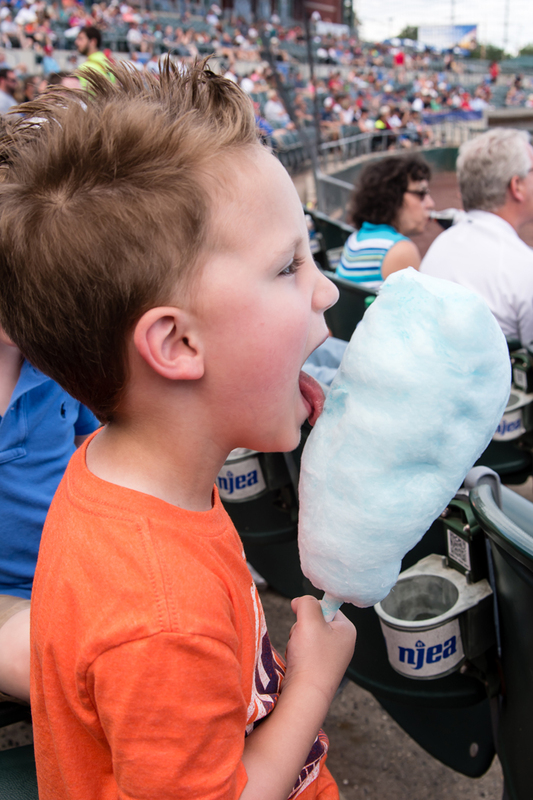 But he warmed up to the idea when he knew his best bud was going to be there and we told him he could get cotton candy, which he calls "cotton and candy". 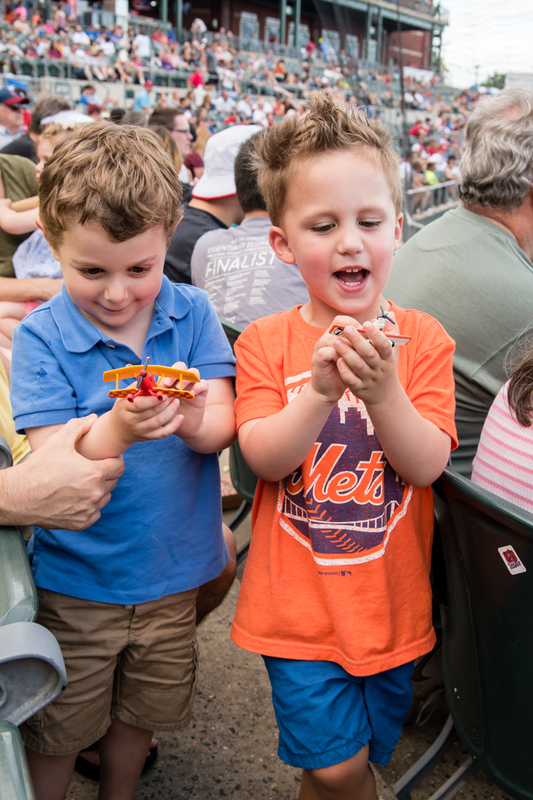 Noah just recently saw the movie "Planes: Fire and Rescue" and was so excited to bring his two new planes to the game with us. The boys were way more interested in playing with them than watching the game. I do however wish I had 3 of them so that there wasn't the issue of sharing with our friend's younger sister. 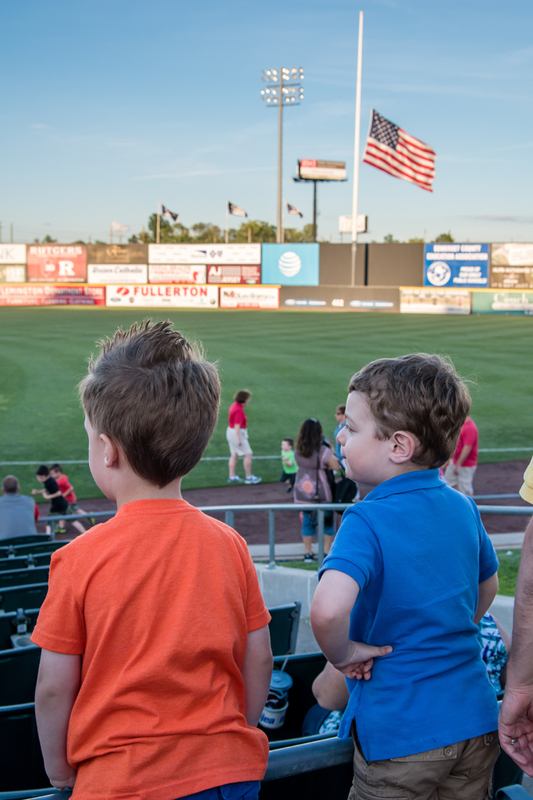 We had taken Noah to his first minor league game two summers ago. Looking back at those photos, Noah looks so tiny! He wasn't even 2 yet and he was positively scared of the mascots. 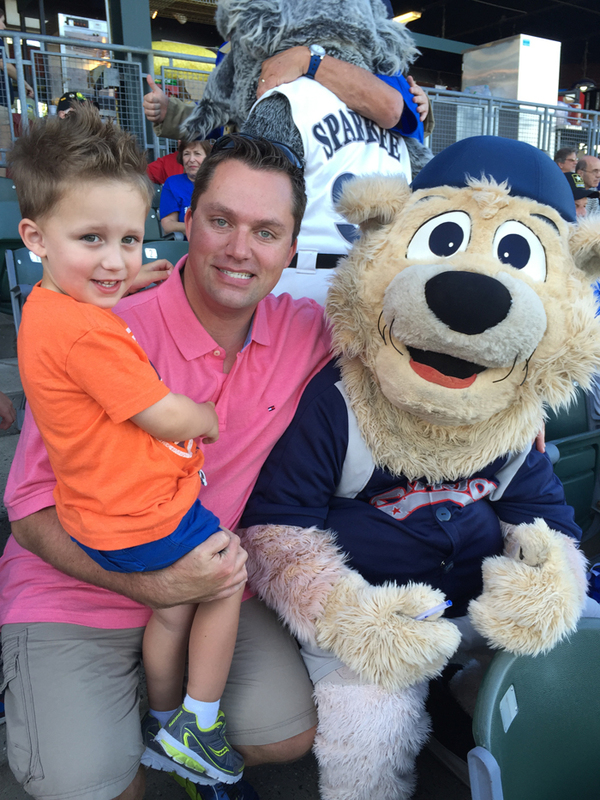 Thankfully Noah has gotten over that fear and was even interested in getting a photo with the bear this time. ^^^ I can't help but laugh at this group photo... sometimes this is the best you can get with 3 kids! 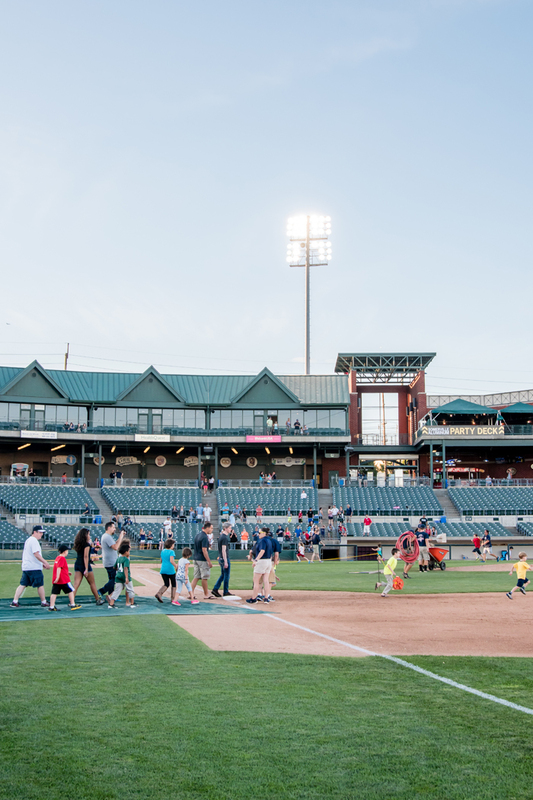 Do you have a minor league team in your town? 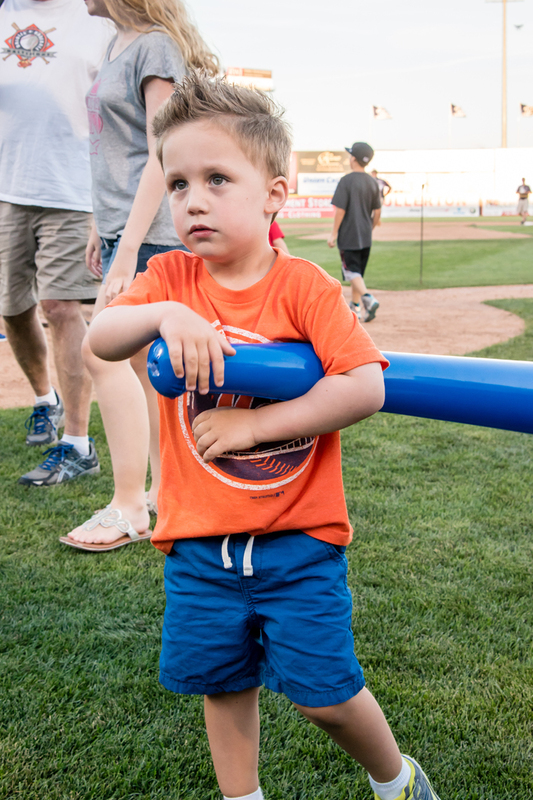 Have you or your kids ever run the bases? What a fun night! And it totally looks like perfect baseball weather! We have a minor league team here and just love going to the games! Haha! Yes to the groupie. Hey, at leas the adults were all looking, right?! Your minor team sounds JUST like our team. They are so bad, lol. At least it still makes for a fun night though. 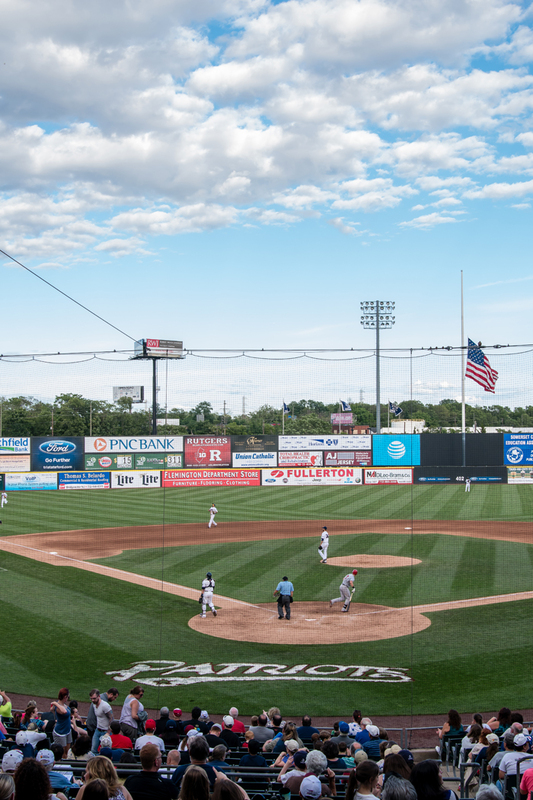 That's the Somerset Patriots?? We used to go to their games! I never knew minor league teams were associated with the majors till recently! I like baseball but I really like stadium food lol. Looks like the perfect day to watch a game, that blue sky! The Dayton Dragons are about 10 minutes from us, that's who we watched last week. Connor wasn't all the into the game but it was still a lot of fun. I love minor league baseball games! We used to have 2 minor league teams here, but now we are down to only one. The games and atmosphere seems more family oriented to me. At least here they do. Our minor league stadium has a pool and now a lazy river around the ballpark. Crazy, right? Looks like you guys had fun. Ballpark food is so bad, but so good. Especially Cotton and Candy. I love the picture of him with the cotton candy! All of the pictures are great. And so fun that you guys got to run the bases! We haven’t gotten to do that yet. A Day at the Beach... with Kids!